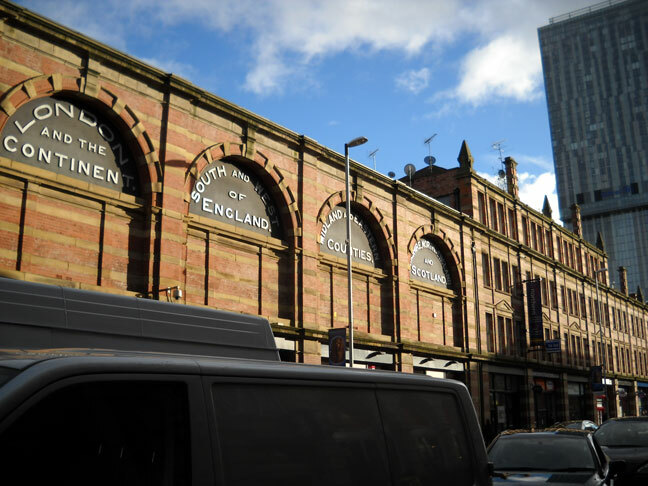 And I've already seen parts of Manchester that even people who live here haven't seen. My new friend Michael has begun introducing me to people with "She's on a mission to know everything about Manchester in one month." And he might be right. I don't like feeling uncomfortable in a city, not knowing where things are, how to get to them. I don't like feeling intimidated by places, by bus systems, by general unfamiliarity. When we moved to Sydney, we did a lot of exploring, but we also took it easy. We have two years, we said. Maybe more. We'll see it. After awhile, this city will feel like a place we know. And by the time I left, we had only been to the North Shore three times. When we heard about cool bars up there, the sheer effort and struggle of getting there kept us at our local instead. And when people here ask me how I liked Sydney, and I tell them I found it hard to know that city, that it felt sprawly and enclaved, that it felt like Atlanta, that you needed a friend, with a car, to really see a lot of it– they understand why I like Manchester so much. Though not many of the people in my program agree with me, some of the other students I know do agree, and these are the people I find I have the most in common with right now. You see, these are the people who say, "Walking tours??! How can I do them, too??" It's been just a little over a month since I was left on my own in this quirky town. I don't know everything about it. But I do feel very comfortable here. 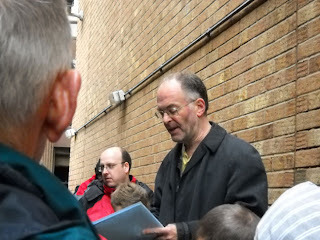 Since my last post, I've done another two walking tours, both brilliant, but honestly, one was a little more so than the other. Last Saturday was Red Manchester-- run by newmanchesterwalks.com, this walk took us around to various sites of protest, worker's troubles, and general radical interest. Of course, I took no pictures nor notes-- so I only remember a few things. The Clarion group began the most influential Socialist newspaper in Britain, and it all started with a group of people riding their bikes through the Lake District, the Clarion Cycling Club. The newspaper had a women's column almost from the very start, I believe, which is pretty radical even for a paper today, hey? They ended up starting a cafe, as well, which was then on Market St. 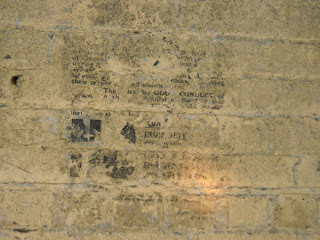 The building is, of course, gone, but the city has commemorated Robert Blatchford's Socialist Cafe with a charming T.K. Maxx. Pretty much a T.J. Maxx with fewer "irregulars." Check out this article by my mate Michael for more on the Clarion movement-- they were a really fascinating group. I saw where Engel's factory was, on Southgate and wandered down quiet alleys. I went in The Royal Exchange, where Engels led the ugly side of his double life, all dressed up and watching the price of cotton rise and fall on the old clapper sign that's still survived, despite the building being bombed a few times. The walk ended at the People's History Museum, overlooking the river between Manchester and Salford, just across from what used to be the New Bailey jailhouse, where the Manchester Martyrs were killed not for committing a crime, but for being Irish. See, the cops couldn't find the exact Irish people who had committed the crime right then. So, they killed these ones instead. As you do. We walked down Deansgate, and passed the truly beautiful John Rylands Library. 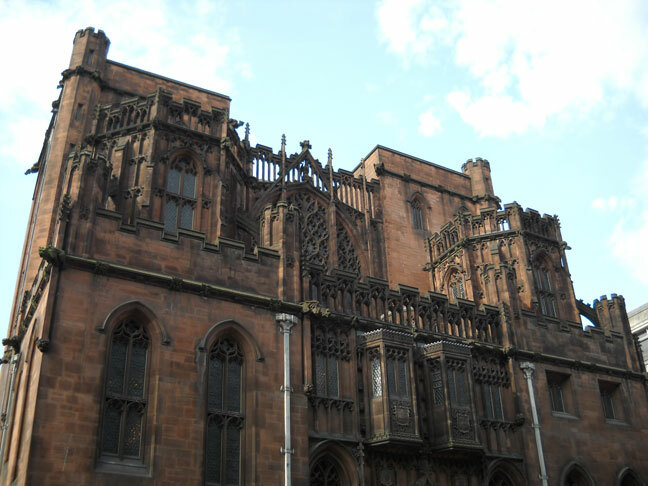 It's part of University of Manchester's library system now, but it was built in 1900, and it holds some amazing collections. The walk ended at the People's History Museum, which I'd seen already with Craig. But it was nice to wander through again. The only problem with the place is that there is a lot to read on the walls... and as I get older and my eyes get crappier, I find it's a strain. But that's my only complaint. Wattage. The next day, I dragged my new pal Ryan with me to see a play that Michael and Bernadette had invited me to see. 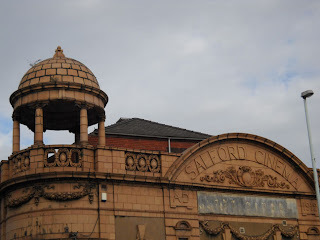 This was very exciting; I hadn't been to Salford yet. This is the river that separates Manchester from Salford. And the former Salford Cinema is the sort of sight that makes me want to explore Salford more. Sadly, I think it's a Pentecostal church now, or something. The play is called Striking the Balance, and it was held at Islington Mill. It was fun and goofy, and super well-acted, if a bit sincere for my taste. I know it's ridiculous to want less sincerity, but I can't help it. Craig thinks it's hilarious that I can actually be offended by sincerity sometimes. This play, though, it wasn't offensive in its sincerity. It was actually pretty good, about the ongoing struggle for equal pay for women. One of the actors brilliantly played a character who is DEFINITELY NOT inspired by Alan Clarke, and any seeming similarity is purely coincidental, of course. Alan Clarke was a British conservative MP, who was a strong supporter of animal rights, though not bothered in the least by the mass human slaughter going on in Sri Lanka due to British arms sales. "Curiously not," he told John Pilger. He showed up at work ahem... "incapable," which is how MPs accuse each other of being drunk, because they're actually not allowed to call each other drunk. What a government, hey? Anyway, apparently, Clarke was a right character, super racist and self-obsessed enough to publish not one, not two, but–that's right–three memoirs! And the actor who played Margaret Thatcher was pure genius; he put on a wig and a pants-suit, and sang and cha-cha'd like you know Margie would. I thought it just as well a bloke was playing old Ironbutt, because no self-respecting woman would ever want to get inside that shriveled rusty skin. During the intermission, Michael showed me around an exhibition at the mill, put on by the Working Class Movement Library and the artists at Islington Mill. Some of the pieces were from the WCML archives, and they were brilliant. Check out these board games! 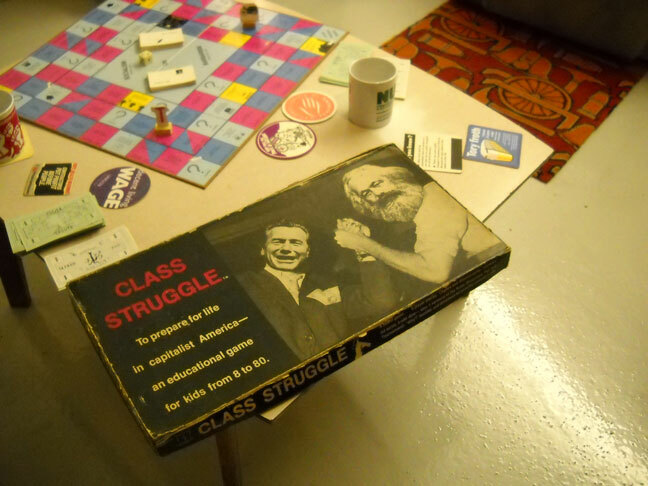 We think it's meant to be a Rockefeller armwrestling with Marx. 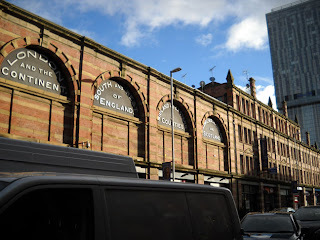 Another night this week, I went out to see Hammer and Tickle at the King's Arms, which is also in Salford. The movie was decidedly less awesome than the pub. But the pub was really great. Nice beers and a friendly atmosphere. A beautiful screening room with a domed roof. Oh, my friends. You have so much to see here. 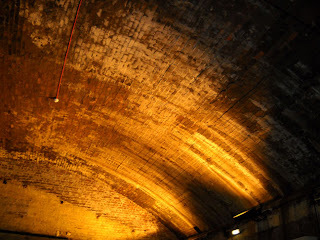 On Tuesday, I again dragged poor Ryan out to another walking tour: Underground Manchester. Absolutely fascinating. 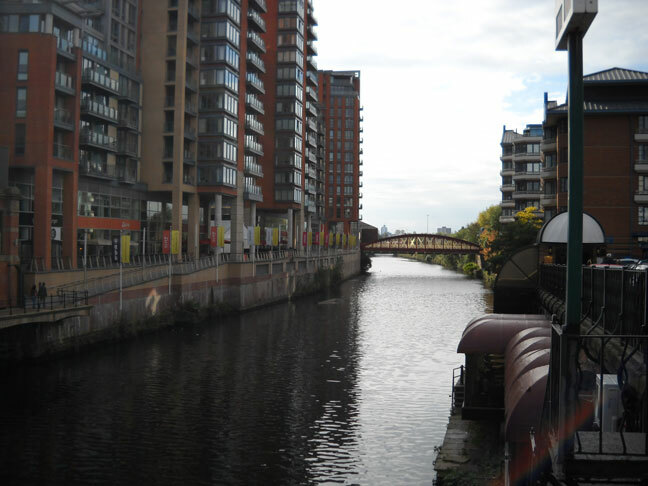 Manchester, it seems, has six rivers running underneath it, through man-made canals and tunnels. 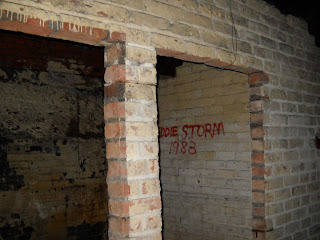 We stood over the site of the American nuclear bunker, though no one's allowed in, of course. 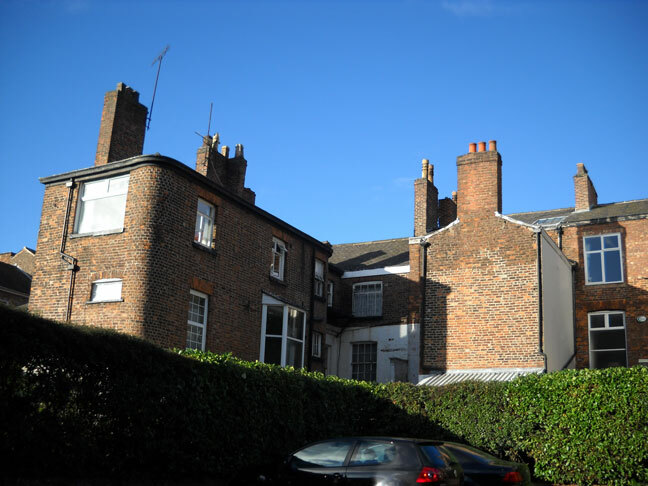 It's now used as a telephone exchange. Ed, the tourguide who is quickly becoming my new best pal, though I have to pay him GBP 5 every time I see him, showed us pictures of nuclear bunker released by illegal urban explorer groups. You can see some here. 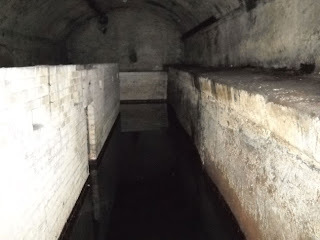 We saw where the Rochdale canal actually goes under the city! And we descended deep into the city's belly, with our torches and hushed voices. Once a canal, the water was pumped out after railroads became the hot new transportation phenomenon. The remaining dried-out tunnels were then used as air-raid shelters during WWII. These places are sealed off, and you can–theoretically–only get access on one of these tours. But, clearly, the urban explorers have made some progress here. This part of the tunnel used to be dry, but the water's been creeping in for a while now. You could take a raft and cross it, but the cops say the water's not exactly... safe, and anyway, you couldn't pay me to get in an inflatable raft on that water. It's smelly and creepy. 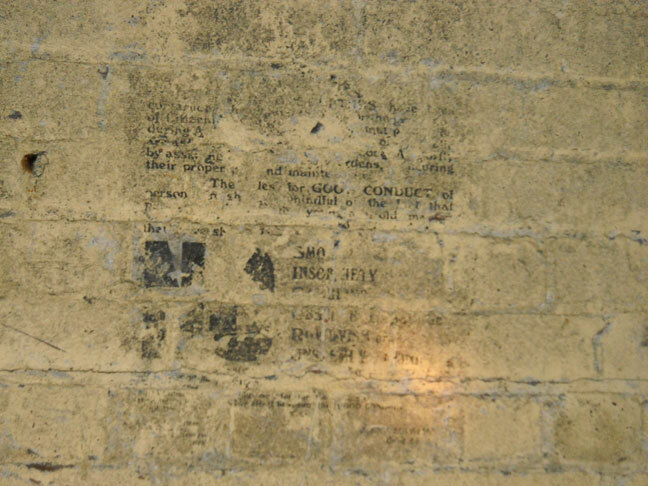 Remnants of the posted signs still remain from when this place was an air-raid shelter. Smoking wasn't allowed, and the people sleeping there had to show GOOD CONDUCT. Can you imagine, coming from work every night to these dark, dank, cold tunnels to sleep with thousands of neighbours, just for basic safety? War: what's it good for? Then we came back up, to sweet fresh air and the sunlight of the city, to see clearly, that we had just been underneath the Great Northern Leisure Centre, which I think used to be a train station. Maybe? And along Camp St., we were charmed by the neat-looking old buildings. 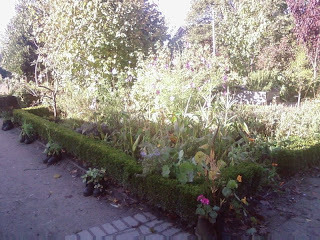 And the lovely little park was charming, too. 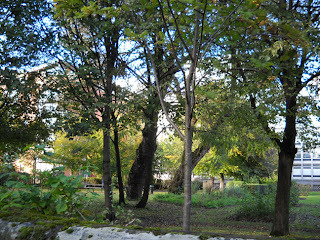 Until Ed told us that this lovely little park grows over a mass grave. During the Industrial Revolution, Manchester's small churchyards suddenly couldn't cope with the dead. So they opened a pit, and if you were rich, you would have a lovely funeral with flowers and a coffin, and you would buried in full splendour. And as soon as the last mourner left, they'd dig you up, throw your body in the pit and sell the coffin back to the funeral home. 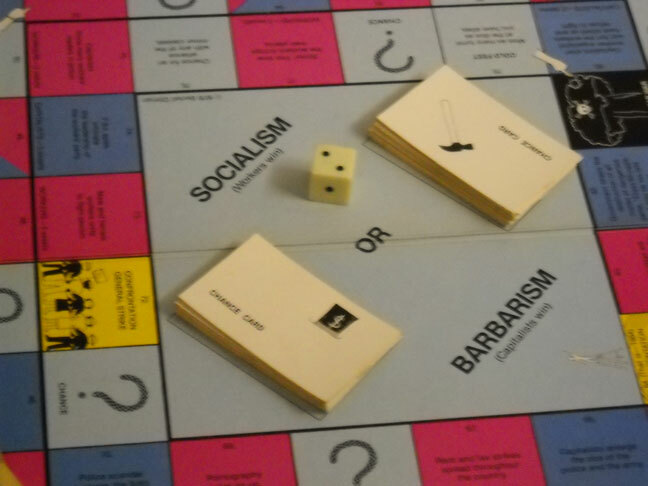 If you were poor, well, you just got thrown in the pit without any splendour. 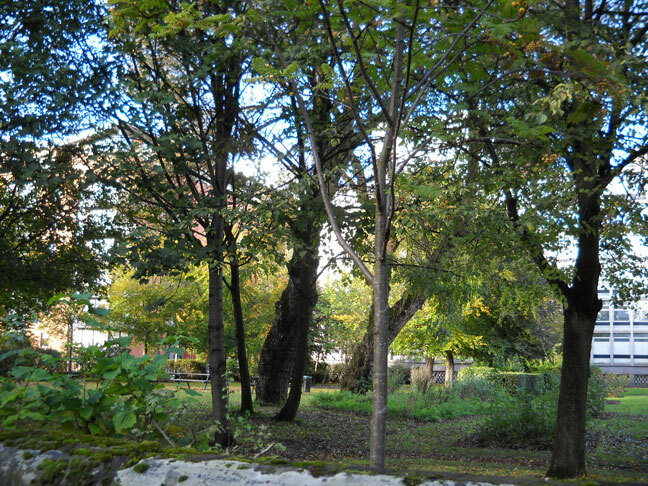 When they were building the underground canal that we had just walked through, they actually decided to divert the canal just to avoid this park, and of course, its graveyard. 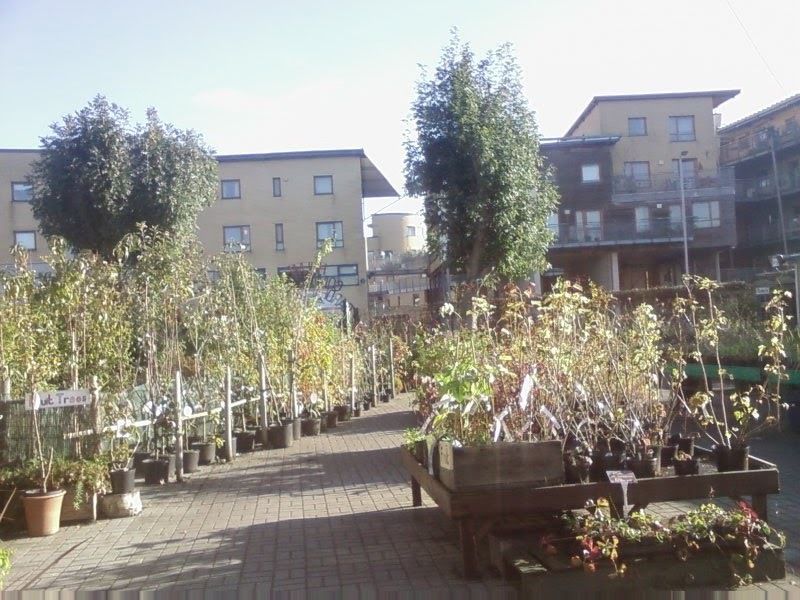 On a brighter note, today was Apple and Pumpkin Day at the Hulme Community Garden Centre! It's (only?) two quick buses and a short walk from my place to the Centre, so this was the first time I gave it a go. And it's lovely. Renata, Craig: you will love this. I could kick myself for forgetting my camera today, but I got a few shots with my phone. They have a little shop where they sell pots and seeds and grow-your-own implements. They take donations for their produce, and they sell loads of starter plants. They have a garden in the back, and they're building their first strawbale building as a classroom. They've even got a rooftop garden. See how they grow things in the old boots? I've never seen a better use of old boots in my life. I'll definitely go back with a better camera soon. Maybe next weekend. Other than that, my course is going well, I think, if maybe a little boring right now. I'm working hard, though, and finding my constitution generally agreeable to this amount of reading and work and trying to see the city at the same time, though I won't attempt the hour-long walk to Salford again any time soon. One month down... another 11 to go.